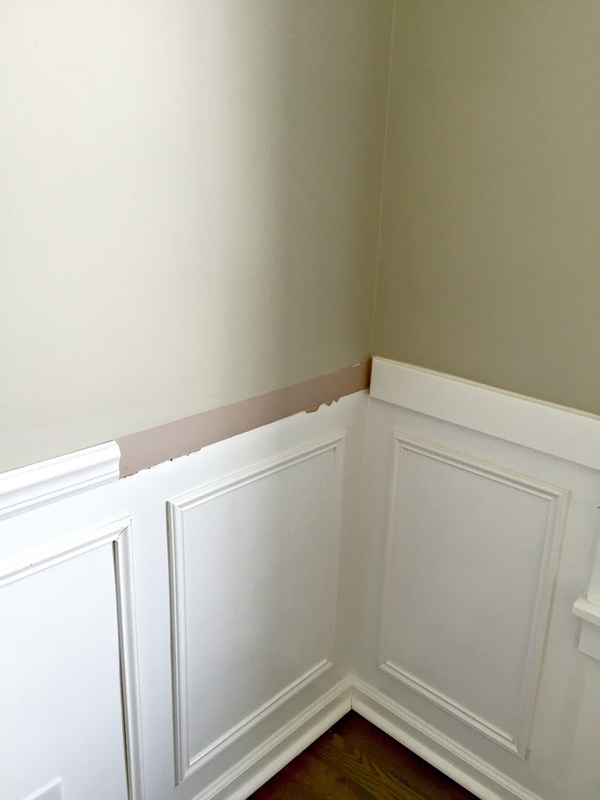 I have been SO excited to share this little redo with you!! It involved some of my favorite things -- moving furniture, which we never, ever do in this house. (Our floor plan doesn't allow for it in most rooms.) And it involved moving or reworking furniture I already had -- I only purchased one new piece for the room and it made the BIGGEST difference! I've told you about our living room before -- it's one of those spaces that has always stumped me. I've tinkered with it many times over the years. We've lived here 11 years and I've never loved this room. And I hated that because it's the first one you see when you walk in our house. I'm terrible with high ceilings and there is really only one wall in the room so that challenged me. That's a photo from years ago, and it's always been a pretty space. It just never felt cozy and like US. And I've told you of my loathing for the sofa. We got it soon after we moved in and goodness -- it was just SO BIG. Massive. Really, really long (100 inches), and the depth was 40 inches. It was a beast. I didn't like the color (yes I picked it out all those years ago, I know) and it was so hard to clean -- the fabric would "shadow" every time I cleaned a spot. This sofa is my perfect example of waiting to find something you love and not just buying something to fill a space. I did that a couple times early on in our house and regretted it every time. I had an idea in mind to rearrange the living room but it couldn't be done with that one -- it was just too big. So I waited. And waited a few more months. And then waited a couple more years. And then I found the one a few weeks ago. 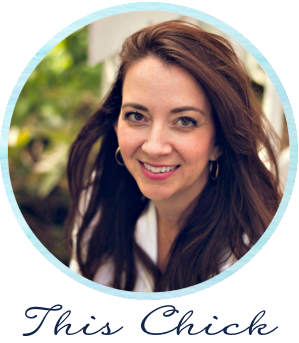 As you may know, I am honored that I get to work with Better Homes and Gardens to share their products every couple of months, and this time they wanted us to talk about furniture. I remember thinking then that it was a really, really nice sofa. 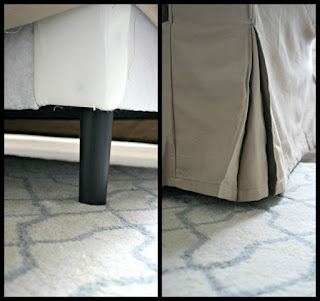 I'm not a huge fan of traditional slipcovered sofas -- but I have always loved the idea of being able to throw the covers in the wash. I remember thinking this one didn't even look like a slipcovered sofa at all. Most of the reviews were very favorable -- some had issues with the frame, but overall owners were really happy with it. I couldn't believe I was thinking about ordering a sofa online (I always said I would never do that because I like to feel the comfort). I read a couple reviews that said the cushions are firm at first but loosen up over time and get comfier. And I remembered sitting on it at the headquarters and being really impressed…so I clicked the button. I don't even know who I am anymore -- but I was SO EXCITED at the thought of a new couch, I was willing to gamble a bit. The delivery process was great -- they emailed me to let me know the status. The only thing was I'm glad I noticed there was a number I was supposed to call one day to schedule the delivery (I didn't get any notice that I needed to do that). The delivery company was awesome and the sofa was delivered within two weeks of ordering. I had to cut through the thin fabric to attach that to the back. The slipcover was super easy to get on and the cushions were already covered. It took less than 10 minutes to get the whole thing put together. I also wish the slipcover was just the tiniest bit longer too -- along the front it's fine but on the sides it rides up just the slightest bit. Ironing it helped that a little. I'm on top of things, obviously! And yet again -- look how pink our walls were before! I still can't believe that. 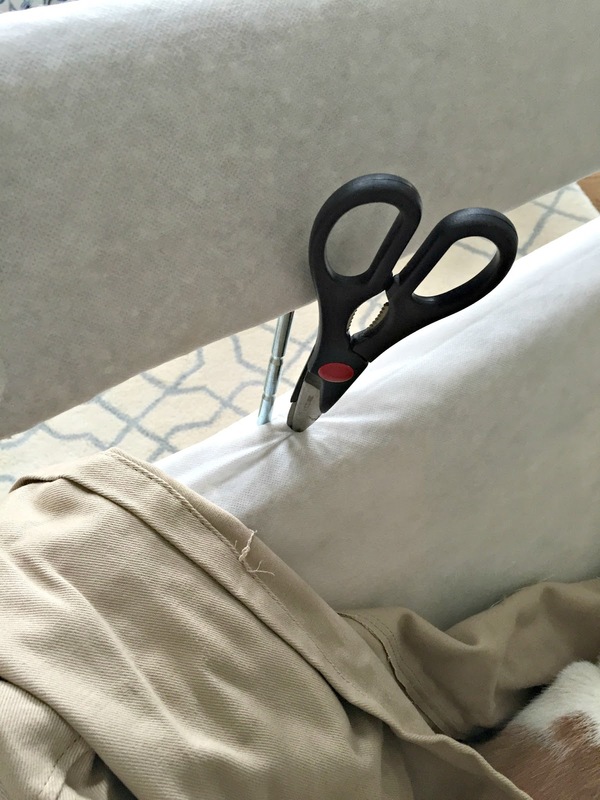 I mean…the sofa blocked this part, so why do it? Other than just doing it because you should? I get tired sometimes people. :) So I found some scrap trim in the garage (that I saved just for this) and finished off the squares. I think in a weird way it showcases them even more? And what's funny is now that things are pulled into the room a little bit, the room feels more open, but also cozier. I don't know how it can be both of those things, but it is. Yes, that is a magazine from July of 2014. I am a magazine hoarder. Funny how perfect the color is with everything else in here. I told you about my love for blue (the color I said I'd NEVER use in our house) and that continues in this room. 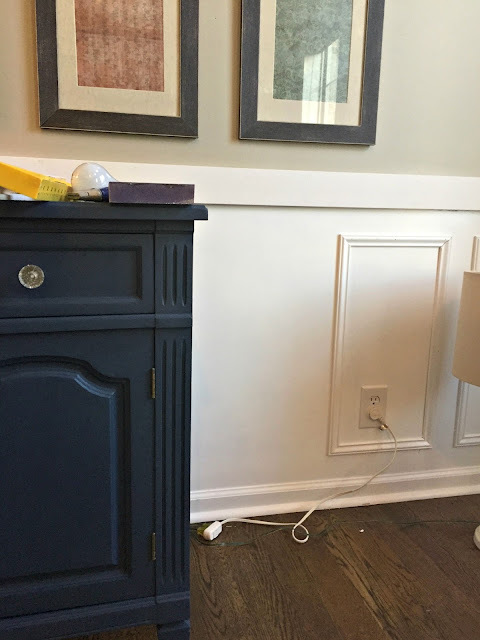 I moved the black dresser that you see in the photo at the top of this post over to the foyer. It worked out so well! Now don't get me wrong -- this is a $500 sofa. I don't expect it to last forever. I do expect it to hold up pretty well and last a long time, so I'll be sure to update you on that. I was pleasantly surprised with the comfort -- it's not one you sink into, but it's not uncomfortable at all and the cushions feel substantial. Any guesses? That bookcase will get moved upstairs. See? More furniture rearranging -- I love it!! 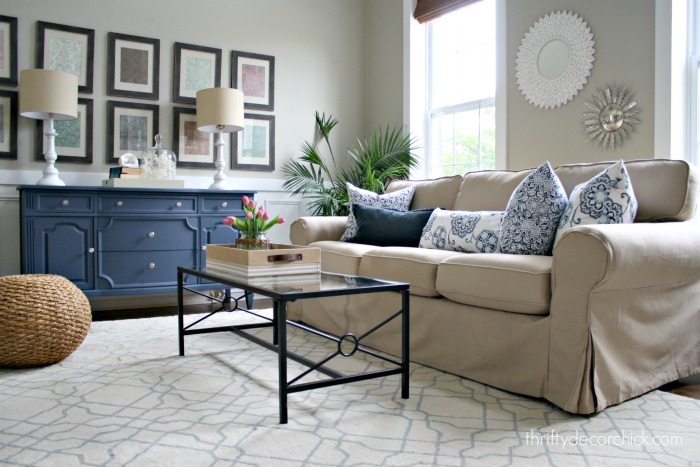 Do you have a slipcovered sofa? Do you like it? Any tips? This one doesn't get as much use so I don't think I'll have to wash it often. Love the new look and furniture arrangement. It look so inviting and beautiful. Can't wait to see the rest of the tour. I love it! I'm a magazine hoarder too, though. 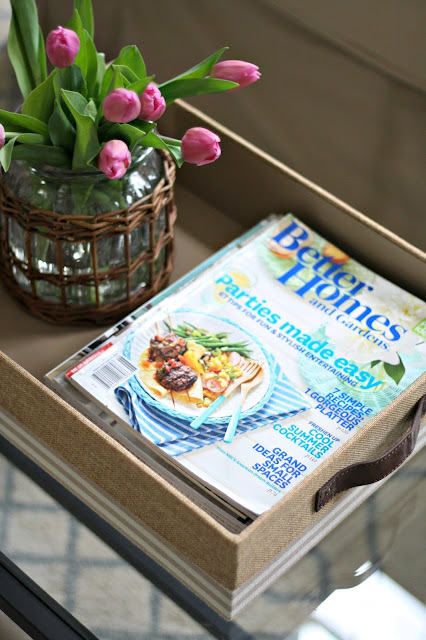 I'm currently on the lookout for the perfect tray for our coffee table so I can corral them! This looks terrific! I love the blue buffet in here. Where did your new pillows come from, or did you make them? Thank you! The pillows were from TJ Maxx and the name on all of them is Domain. I have had a slipcovered sofa for the last 12 years. Three vomiting babies and many sticky peanut butter fingers later and it still looks great! I am a slipcovered sofa girl for life! The room looks beautiful! 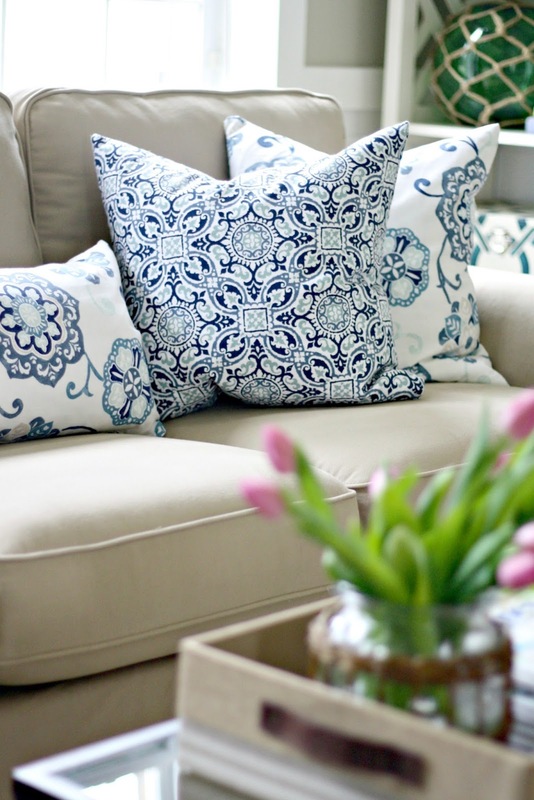 Love the blue and white pillows! beautiful! i love the mix of pillows! I've had a slip covered sofa from PB since September and haven't washed it yet. It's an oatmeal-y color. And I have 2 small kids! I love knowing that I CAN wash it when I need to, but so far I've just spot cleaned once or twice. Love the new look (although I do miss the touches of red you used to use). It looks beautiful! 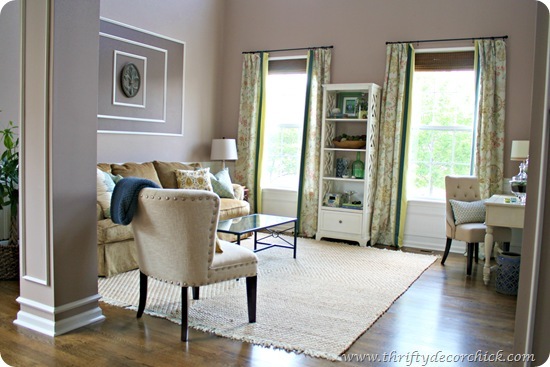 I'm a huge fan of slipcovered furniture, and have lots of it in my home. Easy to wash, but also easy to change if/when I'm ready for something different! I'm loving the look of this space - so welcoming! I love the new pillows and console table from the foyer. They bring everything together in a beautiful way!! Can't wait to see what you have planned for the corner nook! I think 2 chairs in there would look so good too and be a nice sitting room. When I was a kid I used to rearrange my bedroom furniture every few months until my mom finally got sick of it and told me to pick an arrangement and leave it. My house now doesn't allow for much moving, but I love even looking at a room and imagining different ways it could be arranged. So fun! Where did you get the blue and white pillows? Oh man, I'm in LOVE with this room now! It looks so fresh and airy and cozy! Love the color scheme! Looks fantastic! Love the new look. 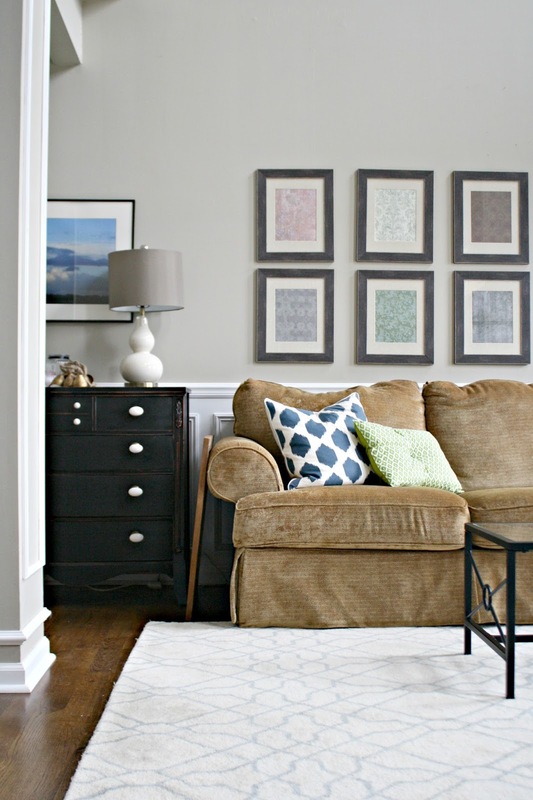 Fabulous pillows too, and love that they go with the dresser from the foyer so well. Nice!! The whole room looks amazing! I'm guessing floating shelves for the new corner project! I love everything about this! The new placement, the furniture, the pillows - all SO good! Love the new space. Thank you! They were from TJ Maxx and all happened to go together. The brand name is Domain on all of them. Love it! 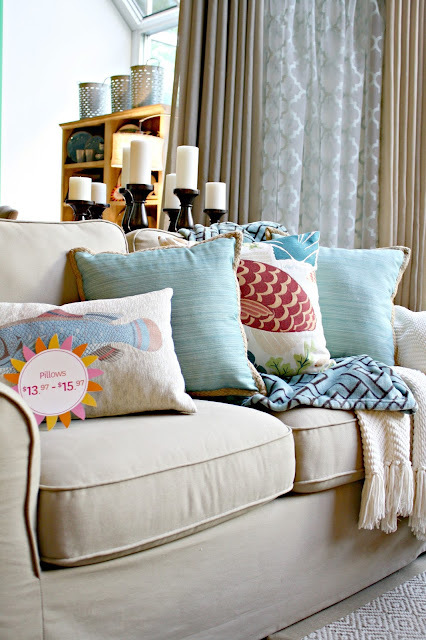 Are the pillows BHG products? It's PERFECT! I just bought a new house, and the front room has given me a huge pause. I'm not ready to do ANY actual fun decorating (painting/art/etc) because we are still full of boxes. But my issue is that, just like yours there are very few actual walls. But your arrangement has inspired me! So pinning this! I LOVE it! I am loving navy blue right now so I really like your bufffet. Now I am more eager to get some projects done in my house with blue. 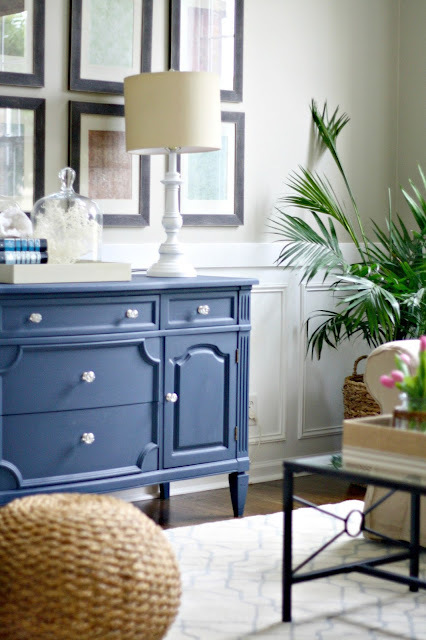 I just finished refinishing a turquoise buffet and hutch but I really want something to be navy blue. Their sofa reminds me of IKEA's Ektorp - I wonder if its just as firm?? Looks very nice and the price is perfect! I've never loved the Ektorp when I've sat on them so I think this one may be even comfier? Oh!!! I love how comfortable and airy this room looks!! Great choice on the sofa. I LOVE having a slipcovered sofa. We have the Ikea Ektorp, and we're on our 3rd slipcover just because I like to change up the look. My tip is do not completely dry the slipcover after washing it. Air drying keeps the fabric from shrinking, there are less wrinkles, and it's easier to put the slipcover back on afterward (plus you avoid ripping the fabric from the shrinking). :) Hope that helps! AND I hope you're having a good summer so far! Hello my friend!! I've heard that's the secret and I will definitely do that. I'm terrified I'm going to shrink it! Your room looks gorgeous! Sometimes we have to admit something isn't working, even if it was an investment at the time. Luckily we've had other rooms to fit pieces in and of course, family needing things helps. I love the sofa. I never could have figured out the assembly. It's good that it's overfilled---not sure what you have---down or what? In any case, it does get smooshy. Do you have a warranty? We do, for ten years and thank goodness because it's looking a little lumpy now!! Yes we do -- so far all I have to do on those is fluff them up and they go back to their shape, thankfully! I love your new sofa, I find that the sofa is the hardest piece of furniture to buy and your choice is perfect for your space! It took me 2 wrong decisions to find the right sofa for our living room and 4 years! Love, love, love this, Sarah. How stunning and gorgeous. You should move the blue chairs from your library in here to complete the look. They would make this space look even more regal. No guesses on the corner project. Maybe some hooks for guests to hang their coats? I'm sure we will love it. I know you were unhappy with the tile in the foyer so maybe it will have something to do with that? They would look nice in there! Absolutely fabulous! And I'm one of those that would love to know where you got your pillows. Thanks!! Thank you!! They were from TJ Maxx and the brand name on them is Domain. This looks amazing! 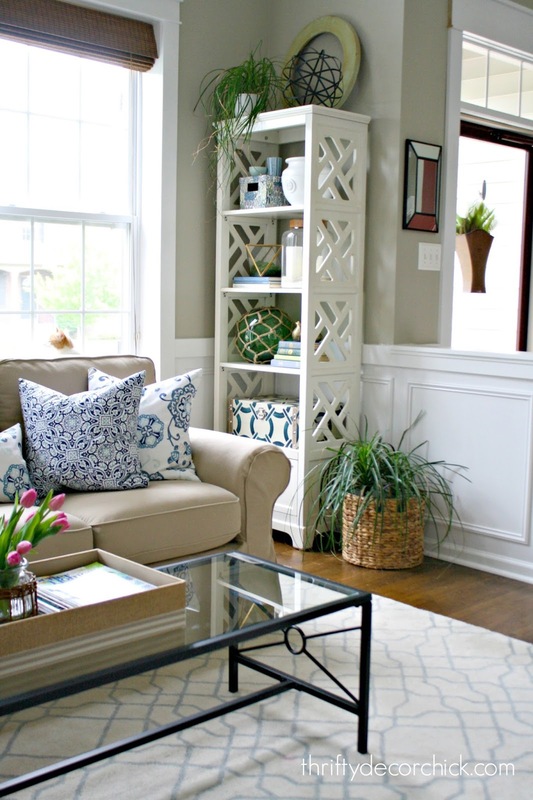 I have low windows, too and never thought of moving my couch in front of them... love this idea. I have a slip covered sofa in the playroom and I haven't washed it yet, but I love knowing that I can! Love how the living room looks! 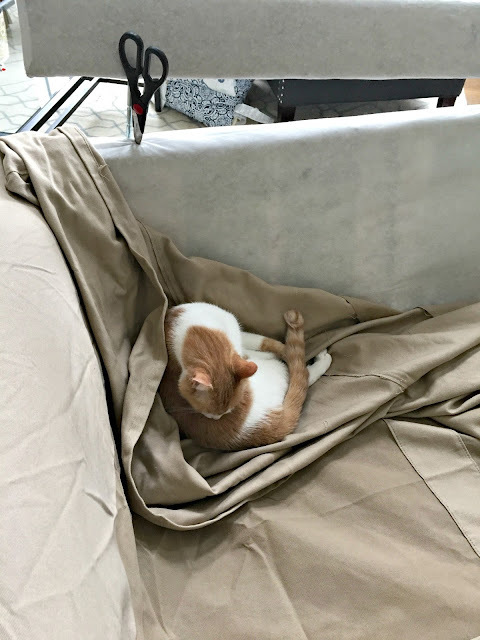 I see Beth mentioned being careful about slipcover washing/drying. I have two sofas with slipcovers and find for me washing cold to warm then drying on low. This does take a while. You will have to position the load several times since it turns into a rolling ball. I always hang mine slightly damp. 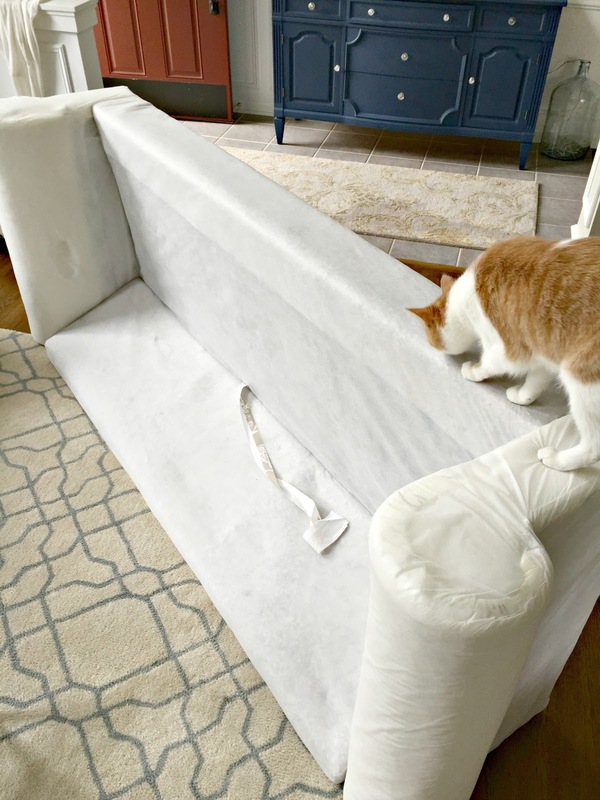 Most wrinkles disappear by the next day and the slightly damp fabric has more give when you are putting the slipcover back on. Be patient, work following directions. They are a bear to get back on but it gets easier! Yes I've heard putting them back on slightly damp helps a ton! Part of me wonders if a person could get away with not puting the back on the sofa and alter the slip cover to make it one of the cool chaise/daybed things. I want one of those so bad for our akwardly long front room. Your room looks great! I thought the old couch was your husband's napping couch? How is he doing with it gone? Oh good! :-) Glad to hear the naps were not affected! Very pretty! Love the placement of the couch and the pillows are perfect. Can you give a source for them? I need those exact colors. The skeleton of your couch looks exactly like our Ikea Ektorp sofa. I guess a lot of furniture makers follow the same design. As far as the leg problem, check with Ikea. The Ektorp legs look to be a little shorter and they are quite a bit stoutly. We move our sofa a lot during renovations and it moves very smoothly. Maybe the bolt is the same size (crossing fingerd). I hope that will work for you. Thanks for the heads up on that, I will check them out on my next IKEA trip -- can you get the legs separately? The pillows are from TJ Maxx and the brand name on them is Domain. Gosh I love your house! Everything is so dreamy. Sarah, have you ever thought about moving the sectional to the front living room? That way you could put a nice couch facing the fireplace/TV in the family room, flanked by an armchair on each end. I think the couch/armchairs combo would be better suited for the layout of the narrow family room. And the sectional would look good in your living room, too. 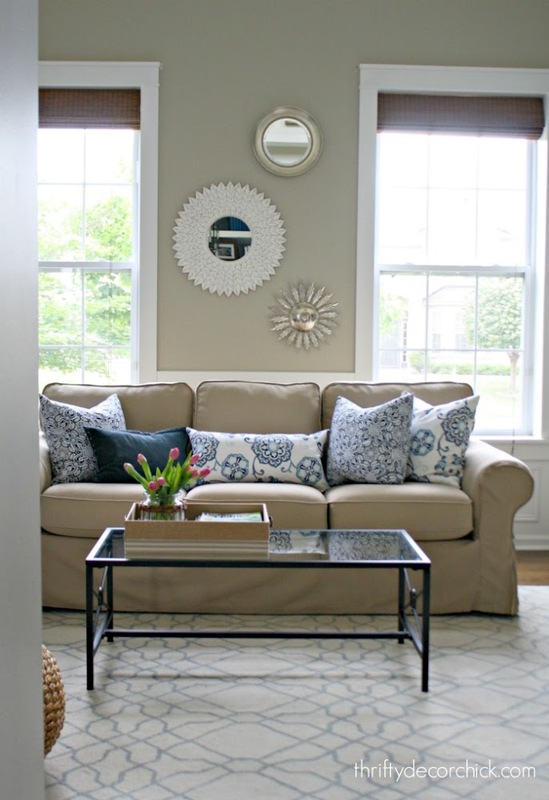 A bigger couch in the living room (like the sectional) eliminates the need for armchairs in there. A good thing, I think, because it seems like it would look awkward to have armchairs in the living room when right behind it in the library there are two armchairs facing the living room. It looks amazing already (the whole house does!) but I think a little couch-moving could open up the new family room a bit and the large sectional would "fill" the living room well. Beautiful re-do, Sarah!! I LOVE the blue in there! Will you please share where you got your pillows - or, "knowing you" where you got the placemats to make the pillows! ;) Also, I have been wondering for forever, where you picked up all those cute mirrors in this room...You always find the best mirrors! Thanks so much! Ha! They were actually from TJ Maxx! The brand name is Domain. The bottom sunburst is an antique find, it used to be a sconce and I repurposed it. I think the middle one was from HomeGoods and the top one maybe from Target? I've had them all for a long time. Thank you! I can't wait until December to see where you wil place your Christmas tree! I love your style - the space looks great and I really like the new location of the sofa. It definitely looks cozy now! 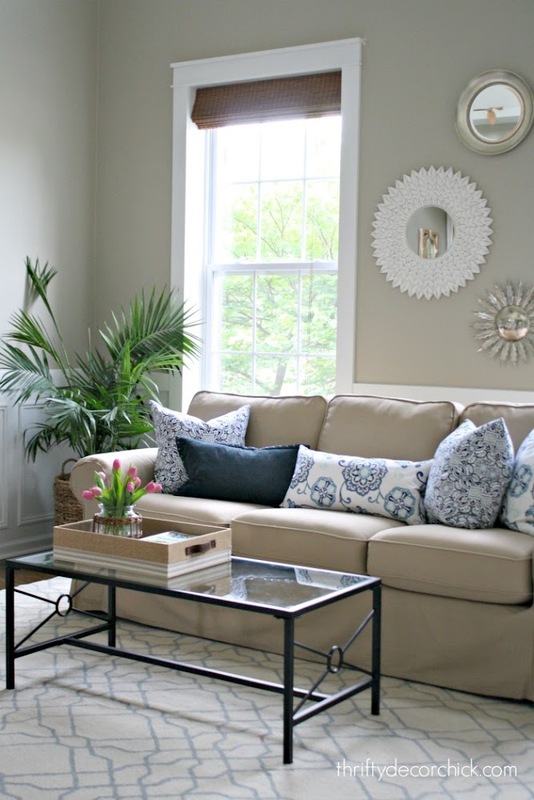 Is the sofa color beige or linen? I'm getting ready to order one and the two colors look very similar online. Don't want to be dissapointed in the color.